Jack and Linda LaDuke’s beautiful son Joseph Glen LaDuke committed suicide on January 18, 2007. He was 22 years, 10 months and 13 days old. It was a terrible emotional blow to his parents, siblings, and other close family members. 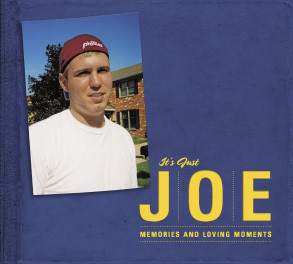 Joe was well loved and loving, and filled an enormous place in their daily lives. After the funeral and wake, when all the family went home to resume their daily lives, Jack and Linda LaDuke were concerned that their Joe would fade from the “Family Memory”, or worse, be remembered only as “the uncle/cousin who committed suicide”. There was so much more to Joe. He was warm, loving and friendly. He was complex. He had hopes and dreams for his future. He was kind and helpful and had a wonderful sense of humor. It may be surprising that not all of the memories shared in this book are warm and fuzzy, but the LaDuke’s goal was to portray their son as he really was, to present a loving tribute to their son and to try to bring some peace and understanding to their living children.